Whole chickens were on sale this week at our local grocery store. I have one in the freezer from a past sale but that one is still frozen. So I spent the $5 and bought one to make the next day. Most of the time I place it in the crock pot but since I am home more I decided to throw it in the oven. In my opinion it lends to a crispier skin. If you are interested in the crock pot version, please click here. We are trying to eat healthier around here since my husband had his heart attack last month. Although, that is not always easy on a budget we are trying to make it work. We are trying to eat less red meat and more lean protein like chicken. 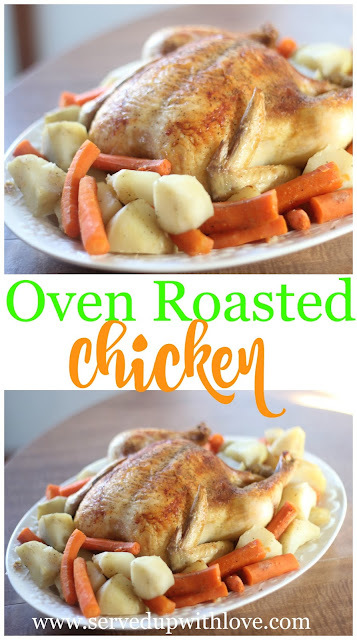 I love using a whole chicken because it can be stretched to at least 2 meals. Making it extremely budget friendly. I like to change up what I do with the leftovers the next night to spark interest with the family. Usually the leftover chicken goes into a soup, a stew, or a casserole. Having the chicken already done makes it super easy. Most of the time the family just eats the white meat. Incorporating it into something different makes sure it all gets eaten. This was a nice change up for us. Our daughter had several helpings which made this moma very happy. Sometimes we are lucky if she even takes a bite of her dinner. She will almost always eat all the vegetables but hardly ever the protein. This recipe will be in our normal rotation for meal time from now on instead of every few months. Place the chicken in a casserole dish or dutch oven. Quarter the lemon and onion and place in the cavity of the chicken. Peel the potatoes and carrots and place around the chicken in the dish. 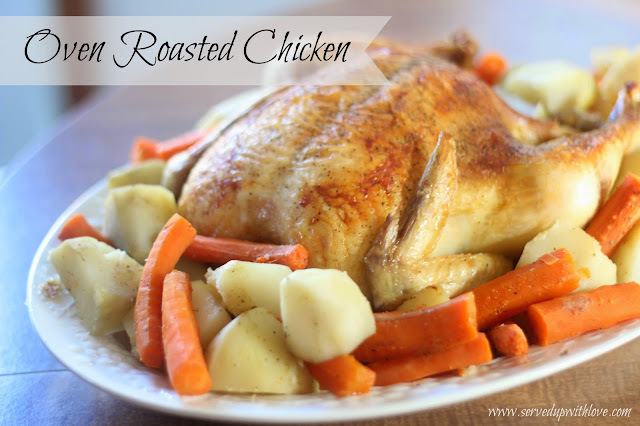 Bake at 350 degrees for 2-3 hours or until internal temperature of the chicken reaches 165 degrees. This recipe was shared in a past issue of Chesapeake Style Magazine. Issues are available online for you to enjoy.